We have deployed a sophisticated infrastructure, which helps us to undertake our entire business operation in a systematic manner. Spread over a spacious area, our fully automated manufacturing unit is installed with modern machines that allow us to formulate our industrial salts and chemicals as per defined industry standard. With the use of these machines, we have successfully achieved a cumulative production capacity of 30,000 Mts of magnesium sulphate heptahydrate. 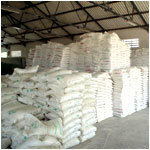 Under the guidance of expert professionals and utilizing unique process, we have manufactured value added products of magnesium sulphate such as magnesium sulphate di-hydrate, monohydrate and anhydrous for the first time in India. To keep the bulk quantity of industrial salts and chemicals in an organized manner, we have constructed an excellent warehousing unit. Our warehouse has different sections that keep our products systematically to protect harmful elements such as air, water and moisture. Our inventory personnel keep records of all the incoming and outgoing material to prevent inventory loss. Packaging is an imperative part of our business operation therefore we have set up a modern packaging & shipping department that ensures a safe delivery of the client's order. Packing is done at our factory in total touch free mode. We maintain highest quality standards in our packaging operations to ensure that our clients get quality products in perfect shape and factory finishes.